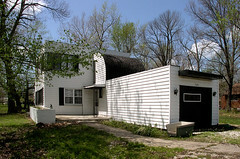 The house definitely needs some TLC, but the essence of the original Art Deco / Moderne house is intact. Following is information describing the house and its context based on the owner's description. • area: approximately 1600 square feet. • heating and cooling: original gas furnace and a 20 year old air conditioner. • other rooms: living room, kitchen, utility room, breakfast nook, library/dining room. • flooring: original wood floors at the stair, upstairs hallway and "master" bedroom; the original wood floors may be hidden by carpet in the other two bedrooms; living room and dining room are also covered with carpet and may have the original hardwood floors beneath; the original rubber floor in the entry way is hidden beneath linoleum; bathroom floor may also feature original rubber floor covered by linoleum. • bathrooms: one bathroom with "split design"; shower & tub with sink in one room and toilet with sink in the adjacent room. • basement: no basement; there is a crawlspace about 2 feet deep with an access door. • lot size: about 2/3 acre. • location: quiet street, with a very large farmer's field under cultivation directly across the street; most neighbors are retired or older working adults; no small children in the immediate area; safe, friendly environment. • reason for sale: owner is moving out of state; owner is interested to sell to someone interested in preserving and enhancing the house. You can view a series of images of the house I've posted to my Flickr photostream here. You can find Armstrong's original perspective sketch of the house here. Photograph by Andrew Raimist, April 2007. It is nice to see that modern architecture doesn't have to be an expensive custom built project. This house is relatively inexpensive and looks very unique. It is affordable art. Check your email for a message from me with the photograph of the rear of the house attached. Let me know if you're able to uncover new information about the house and its original owners.